﻿﻿Usually unremarkable ratany’s unique blooms resemble an exotic insect. ﻿﻿﻿﻿﻿﻿﻿Common throughout Texas, ratany plants hide in plain sight. 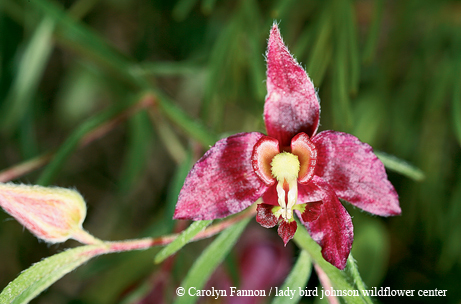 The only times the plants will likely catch your eye are in late spring or early summer or after a fall rain, when the amazing flower opens up to mimic an exotic, imaginary insect with a green head and pennant-shaped, reddish-purple-colored wings. Ratany grows in open fields and rangeland throughout the state. The most widespread ratany in Texas is Krameria lanceolata, which has sprawling prostrate stems with silky leaves that lie flat on the ground. Ratany is one of the very few plants on earth that belong to a “monotypic” plant family. That is, only one genus, Krameria, consisting of 18 species ranging from the southwestern United States to Chile, makes up the entire family, the Krameriaceae. Texas is home to four of these species. In addition to the low-growing Krameria lanceolata, the other three species are small shrubs. University of Texas botanist Beryl Simpson’s extensive research on ratany has uncovered fascinating facts about the plants. Deep inside the flower is a pair of glandular petals, elaiophores, which produce fatty oils that are prized by female digger (Centris) bees. As the bee rummages around the flower to collect the oils from the petals, she pollinates the flower. The bees use the fatty oils to line their underground nests where they raise their young. The name “ratany” comes from the Peruvian word for the roots of ratánhia, meaning “ground creeping.” In the late 1700s, botanist Hipolito Ruiz discovered women in Peru chewing the roots of ratany plants. They explained that they chewed the roots to whiten and strengthen their teeth, but the roots had an added benefit — they colored their lips red, and the color lasted all day. In northwestern Mexico, the Seri make a reddish-brown dye used in traditional basket-making by scraping, mashing and boiling the bark and cortex from ratany roots. The powdered roots have also served, especially in Portugal, to color wines ruby red. Botanists love to figure out which plant family is most closely related to the other. When the ratany family was discovered in the 1750s, no one knew how it fit into the great family tree. It was traditionally thought to be a close cousin to the legume family or perhaps the milkworts because ratany flowers most resembled flowers in these plant families. Simpson solved the mystery a few years ago using DNA research. We now know that ratany is most closely related to the desert-adapted caltrop family, containing desert poppy, creosote bush and the infamously prickly goathead.